Danny Rose - suspended, but allowed to play tonight. 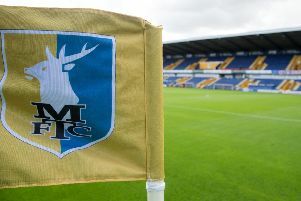 The Mansfield Town side showed seven changes for tonight’s opening group game against visiting Doncaster Rovers in the revamped Checkatrade EFL Trophy. Out went Jensen, Benning, Mitch Rose, Collins, Hurst, Green and Henderson. Into a still very strong team came Shearer, Baxendale, Hamilton, McGuire, Hemmings, Taft and Danny Rose. Danny Rose still has one game of his three-game ban to serve but was allowed to play tonight due to the EFL Trophy disciplinary rules being separate to other competitions. Rovers made six changes with teenager Alfie Beestin making his debut. The Rovers side also included former Stag Matty Blair. STAGS: Shearer, Bennett, Pearce (C), Taft, Howkins, Chapman, McGuire, Baxendale, Hamilton, Hemmings, D. Rose. Subs: Jensen, Benning, Collins, Hoban, Hurst, M. Rose, Hakeem. DONCASTER: Etheridge, Calder, Williams, Middleton, Wright, Houghton, Blair, Mandeville, Beestin, Evina, Fielding. Subs: Marosi, Butler, Pugh, Longbottom, Amos, Barker, James. REFEREE: Neil Swarbrick of Preston.